No twentieth-century justice exerted more influence, both positively and negatively, during his tenure on the Supreme Court than Felix Frankfurter. A confidante of President Roosevelt, who plucked Frankfurter away from his Harvard Law School professorship to appoint him to the Court upon the retirement of Justice Louis Brandeis in 1939, Frankfurter led the argument in favor of judicial deference. Despite his New Deal sympathies, Frankfurter was never an automatic vote for legislation or administrative rulemaking. For Justice Frankfurter, the law or rule had to have a reasonable connection to the underlying public purpose of the legislation passed by Congress in order to be constitutional. This check on the power of administrative agencies was important precisely because of the power that those agencies had accrued from Congress. Only where that connection was clearly present would Frankfurter agree to defer to the legislative or administrative body. Increasingly complex legislation, extending from the relatively direct origins of the Securities Act of1933 and the Securities Exchange Act of 1934, to the Investment Company Act of 1940, the Investment Advisors Act of 1940, and the numerous administrative rules made by the SEC to interpret and enforce those statutes, were all considered by Frankfurter and his colleagues before he left the Supreme Court in 1965. It was the complexity of the law and rules, caused by changes and innovations in the securities industry responding to new investor demands and products, which made Frankfurter’s judicial deference increasingly difficult to practice. Frankfurter believed that the development of constitutional law was the slow, careful process of the accretion of new ideas. When the majority was wrong, the duty of a justice was to point out the mistake, and bide his time. Just as importantly, Frankfurter believed that the duty of the Court was to defer when it could determine legislative intent based upon hearings and legislation passed. Frankfurter tempered his own bias in favor of administrative expertise through his recognition that the law must still reflect popularly-elected majorities. For Frankfurter, administrative agencies such as the SEC had a duty to clearly follow the intent of Congress in administering the law. But judicial deferral, the foundational principle of one of the most influential justices on the court, would soon be challenged by his growing concern about what Congress intended and whether the SEC had followed its intent. 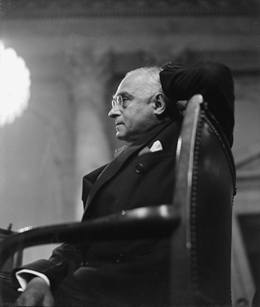 In a number of SEC cases that came to the Court after the New Deal, Frankfurter dissented because, after careful analysis of the actions of the SEC, he believed that they had not been faithful to the expressed intent of Congress in passing legislation. That defect required him to strike down the actions of the SEC staff where he felt it had not been faithful to that intent. (47) Letter from Felix Frankfurter to Justice Harlan Stone on First National Bank of Boston vs. Maine, January 7, 1932. First National Bank of Boston vs. Maine involved Maine’s attempt to tax at the death of the Massachusetts resident who owned stock of a Maine corporation, due solely to a decedent’s Maine residency. The Court struck down as impermissible double taxation Maine’s attempt to tax the decedent’s estate, despite the fact that Massachusetts and Maine both provided credits for the taxes paid by the owner of stock. (48) See Thompson and Sullivan, “The Supreme Court and Private Law”, Appendix A, where the list of cases expanding SEC authority where Frankfurter dissented includes SEC v. W J Howey Co., Wilko v. Swan, and SEC v. Variable Annuity Life Insurance. No opinion authored by Frankfurter expanding the power of the SEC is listed. Letter from Justice Felix Frankfurter to Justice Stanley Reed on Otis & Co. v. United Light Power Co.